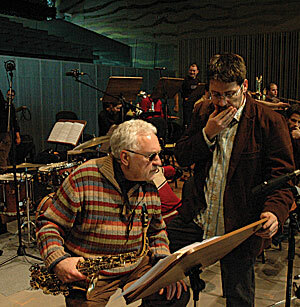 They say that in life doors may open and doors may close but, as he approaches his 80th birthday, more doors seem to be opening than closing for jazz legend Lee Konitz and his colleague, composer, arranger, and saxophonist Ohad Talmor. Over the past few years, Talmor has been Konitz's major collaborator – and guide – through portals that have led to somewhat unfamiliar territory for Konitz. Together, they've explored the relatively uncharted territory of Konitz the Composer via Talmor's brilliantly realized, up-to-the-minute, sophisticated "larger ensemble" settings. The journey from Upper Austria and the dual-reed-and-string-quartet-based String Project, to New York and the edgy, fleet-footed New Nonet has led the creative duo to (how appropriately!) 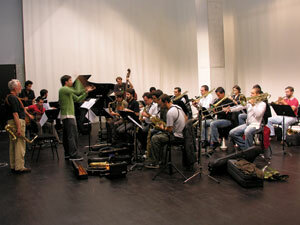 Porto, Portugal, through a door opened by Pedro Guedes, co-manager of the Orquestra Jazz de Matosinhos. "I saw a concert of the New Nonet here in Porto back in October 2004," recalls Guedes (pronounced "geh-chee") about his inspiration for and, eventually, the impetus of this project. "I loved the concert so much that, the next day, I asked Ohad if he would be interested in writing a program for our big-band devoted to Lee's music. The idea, since the beginning, was to do an overview of Lee's past musical work until the present, acknowledging his effort to create new music every time." The industrious Guedes approached the Port Wine Institute about sponsoring the project because, according to Guedes, "Port wine is a symbol that represents the country and specific region where the OJM is based, and port wine is a drink that embodies [like Lee's music] the qualities of aging: it gets better and more flavorful with time." They agreed and thus opened yet another door: that to the Lee Konitz-Ohad Talmor Big Band featuring the Orquestra Jazz de Matosinhos. So, what better to name the CD but Portology, considering not only the project's locale and major sponsor, but also reflecting the "study" of musics and cultures that took place in Porto between Konitz, Talmor, and the OJM. An above-average amount of collaborative effort (and sweat equity!) went into creating, custom tailoring, re-working, rehearsing, and delivering the music on this CD and in subsequent performances by the on-going Konitz-Talmor/OJM collaboration. Konitz, whose previous big band experience was as a member of the Stan Kenton Orchestra sax section – not as its featured soloist – says that, though he loves hearing and playing his music in a big band setting, navigating the path between written part and spontaneous improvisation was a challenge. "I like to close my eyes and listen, and I can't quite do that," admits Konitz about playing in this large ensemble setting, adding, "but when it finally gets under the pressure of the performance, usually something works for me that makes it more real." 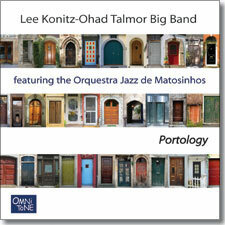 Helping Konitz make it real and traverse the new portals required to front a big band was Talmor, Konitz's friend for nearly fifteen years and his collaborator, arranger, co-composer, and director for this and the past two Konitz-Talmor projects on OmniTone. As he did previously with the String Project and New Nonet, Talmor had to face the challenge of reinventing and expanding what Konitz calls "fragments or extended themes" into full-blown arrangements – this time for a seventeen-piece big band (!) – in a way that complemented Konitz's looser, freer improvisational style. Talmor, who compares Konitz's seat-of-the-pants improvising to a tightrope dancer, says getting the right blend of written and open sections for Lee in such a large ensemble context required considerable care and collaboration. "I try to give Lee the liberty to be ‘away from the page' and to keep what's going on behind him less intrusive," explains Talmor. "Lee is one of a rare breed of true improvisers, and that's what sets him apart from the vast majority of what's going on in the jazz world today." And the result is, as Talmor describes it, "magic." Now it's time to open one more door: that to your ears and mind and, hopefully, heart as you listen to the exceptional musical treat before you. Though Shakespeare wrote, "Men shut their doors against a setting sun," as you savor the richly-blended, vibrant flavors of Portology and marvel at our intrepid hero effortlessly tightrope dancing into his ninth decade, you'd have to wonder if that sage observation applies in the case of Lee Konitz.